The west coast of Canada is known for its breathtaking views. Why not enjoy these views with your someone special? British Columbia’s landscapes are intrinsically very romantic, allowing you and your loved one a chance to enjoy many outdoor activities the province offers while building life long memories. Many resorts across the province are ready to set up perfectly romantic getaway, check them out below. “A place to do nothing, then rest afterwards”. This elegant Mediterranean style villa spreads across 115 acres is located in beautiful Penticton BC. There are retreates for creative couples to reconnect to their art or for a romantic get-away for two in one of the stylish villas. The estate even offers a beautiful roofless room for a romantic summer get away which allows for basking under the stars in a private tub. The surrounding area is relaxing and quiet and definitely, one of a kind. A scenic 40-mile drive west of Victoria, and you will arrive at Point No Point Resort! The resort overlooks the Strait of Juan de Fuca perched on a bluff above the shoreline across 40 acres of west coast waterfront. Super romantic setting as you and your partner will enjoy privacy, hiking, cooking or be served fresh west coast fare. Even get pampered from a selection of in room spa treatments! End your evening snuggled up with you private fire place away from the rain and enjoy the views and the company. This wonderful restorative hot spring is open and available for a visit all year long! Take your partner and escape the city worries in this water front property overlooking beautiful Upper Arrow Lake. Pamper your partner with a romantic evening under the stars in the hot springs and enjoy dinner at their award-winning restaurants. Romantic package includes 2 nights in a luxurious spacious King Chalet, 100 dollar meal voucher, and 55 minute massage or spa treatment of your choice and of course, access to the pool and hot springs. This British Columbia wilderness resort is a diamond allowing guests to enjoy some of the worlds more dazzling environment. The resort offers eco adventure, relaxation and terrific customer service. Offering many romantic packages, they allow couples to relax with wine, quiet time and active time such as hiking, tennis or relax with tea and a book. Package includes 3 nights, wine, all gourmet food, beverages, and use of all amenities including fly fishing ponds and mineral pools. Located in Kootney Bay and founded in 1963, Yasodhara Ashram is a vibrant spiritual community for you and your yogi partner to enjoy a one of a kind retreat. The centre offers many retreats, many of which can be personalized to be catered to your unique wants. The surrounding is amazing, with a lake, forest, prayer rooms to leave you feeling both physically and spiritually fulfilled. A unique get away that will leave you feeling reconnected to yourself, nature and your partner. Located in Madeira Park in Pender Harbour, just 2 hours by car from Vancouver, the Painted Boat resort offers a classy west – coast furnishing with stunning water front view! At the Painted Boat resort, you and your partner can relax in the many romantic amenities like hot tub, spa garden. 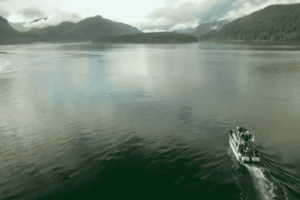 Leave the world behind in the tranquility nested in the wonderful west coast of Canada. 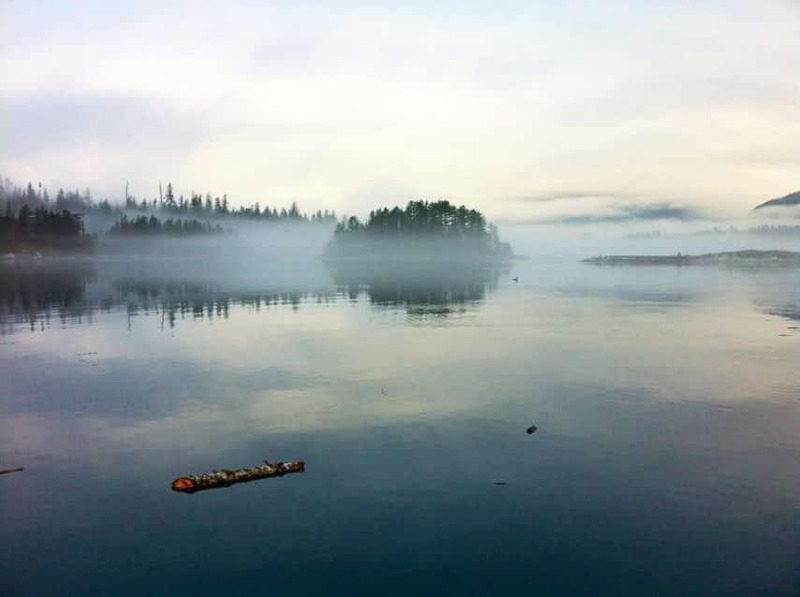 Tucked far away from the bustling city, the Nimmo Bay Wilderness Resort is a family run resort in the Great Bear Rainforest in British Columbia. It’s a wonderfully romantic setting to reconnect and escape. The best part is that this vacation is tailored, so you and your partner can create a magical trip of wilderness and love with many options including Wilderness and Wildlife Adventure or helicopter day trips! Your room will come included with sparkling wine, chocolate covered strawberries and private dining. Rockwater allows for a picturesque retreat for you and your partner to relax and enjoy one another. Located on beautiful Sunshine Coast, you will enjoy a forested boardwalk, eat dinner while looking at the Georgia Strait. Offering a two night get away, enjoy 2 nights, 3 course dinner with paired wine, a 60 minute couple massage and breakfast each morning. You will relax to the sound of the waves lapping and the birds chirping! Rockwater also offers an elopement package, should you be looking for a way to be married without the madness. Enjoy the views of Lake Osoyoos in the Okanagan’s Walnut Beach Resort. You and your partner can unwind with expansive views, an impressive heated pool while trying yummy red and white wine from the local vineyards at the wine bar! The suites are designer, giving you the comfort of home but better. Depending on the time of year you choose to visit, the resort will set you up with golf, wine tasting or skiing! Options are endless! Just south of downtown Tofino, Long Beach Resort offers 8 acres of stunning beach front property. With modern amenities, fantastic customer service and tranquil ambiance, a weekend away in Tofino is a relaxing and romantic place to be. Tofino is a great place to explore including surfing, hiking and biking. Long Beach Resort offers 3 restaurants including the Great Room which offers delicious local cuisine, live music and sunset views. In the West Kootneys, explore a unique cottage! Each room has its own garden and the interior, as it’s a dome, has a unique gentle curve in all the spaces. When your finished relaxing and smelling the flowers, West Kootneys is booming with things to do! Stroll hand in hand through the ghost towns, galleries, museums, cafes, local boutiques and the bustling market on Fridays! Depending on the time of year there is plenty of outdoors active things to do including swimming, kayaking, golfing, hiking, or cross-country skiing. Crystal clear and all natural, the mineral hot springs in BC at Fairmont Hot Springs Resort are a legendary attraction and also Canada’s largest natural hot springs. Slip into the soothing hot water and feel your worries wash away as you gaze through the steam toward stunning views of the Rocky Mountains. Enjoy unlimited access to the hot springs, get rejuvenating and therapeutic spa treatments. and more at this amazing resort! Take in the serenity of the nature on the 10-acre property located near Anahim Lake and the wonders of wildlife. You can and your partner can enjoy wonderful meals, exceptional hiking, birdwatching and just taking in the unique views this natural property has to offer. Surprise your partner with a spectacular floatplane tour for a romantic bird’s eye view of the area including waterfalls, glaciers and mountains. A Vista Villa offers a private haven for couples to enjoy a carefree vacation or romantic getaway. The spaces and amenities are designed to assure guests will have the opportunity to shut out the outside world and reconnect with each other. Guests will feel relaxed and recharged and can take great comfort in knowing that their needs have already been anticipated. Located in wonderful Kelowna, the villa offers many packages including wedding, elopements, honey moons or romantic get aways. Guests who enjoy Echo Valley feel a magical effect of the stay as they feel calm, content and joyful. An escape to this ranch and spa is unlike another vacation as you will truly reconnect with the beauty of nature away from the world. It’s a luxurious place to enjoy with your love, nestled in BC’s Cariboo Mountains that has hundreds of thousands of acres of mountains, valley, forest and canyons. There is much to do including horse riding, and other ranch activities, a stunning spa and world class food. Guests who stay leave feeling relaxed and recharged! In Naramata British Columbia, this character home is tucked away on the privacy of Naramata Beach. Its secluded, romantic peaceful. There is lots to do in the area including wine tours, festival of garlic, Silver star mountain is one hour away and there is also a drive-in movie theatre! The hideaway promises quiet natural surroundings in an idyllic forested area, the perfect setting for some quality time with your partner. This unique and luxurious country home offers a sweet get away in Lake Country, Oyama. The Inn has been built with everything in mind, including comforting place to rest with quality comforts and beautiful panoramic views of the setting including the lake and mountains. The bed and breakfast even offers a very affordable romance package that includes a welcome basket, a hand-picked cheese tray, chocolates and a rose petal turn down service. After a peaceful sleep, enjoy a hearty breakfast with lake views. Try something totally new and spend a few nights away from reality with your partner in a yurt! Located in Ucluelet, BC these yurts offer unique west coast charm while you stay in a comfortable waterfront yurt that offer the vibes of camping without needing any gear. The Hummingbird yurt is the perfect option for a couple’s getaway. Enjoy private beach access, wrap around cedar deck with chairs, housekeeping, coffee, gas fireplace and you can even bring along your four legged friends! Recall how fun tree houses were as children? Enjoy this exceptional experience again, in a natural forest environment in a treehouse resort on Vancouver Island near Qualicum Beach. There are 3 spheres to choose from, with Melody being the newest. To arrive, you will have to be adventurous and cross a short bridge, climb a few stairs that spiral a tree! A unique feature is the murphy bed, meaning it can be folded up during the day so the space can be used and turned into a treetop bedroom at nightfall! Settled on the 685 acres Skeena Meadows Wildlife Preserve, at this “glamping” site – glamourous camping – you will be very likely to encounter many wildlife including moose, bears, and mule deer’s. The scenery is unbeatable, totally secluded and includes mountains, meadows, forests and hillsides. The tents are luxurious. They are all spacious and have 5 star amenities including hardwood floors, leather furniture, hot tubs, full kitchens and each offer a few bedrooms. A totally romantic experience! Every moment you spend at the beautiful Brentwood Bay Resort and Spa will create new memories for you and your partner to cherish. The rooms offer ocean views and wonderful amenities, you can enjoy local cuisine, spend the day exploring local marine life and completely let go at the Brentwood Bay Spa which offers an array of treatment promoting wellness and relaxation. They offer a special 3- night romantic get-away that includes a private hot tub, gourmet breakfast, passes to the Butchard Gardens, and $150.00 dining credit to spend at the romantic seaside restaurant or Brentwood pub. Have a couple escape with your special someone at Beach Club Resort in Parksville. Their indulgent romantic package includes your choice of 1 – 3 nights in a n luxurious ocean view suite, a couples massage at the Stonewater Spa, romantic dinner at Pacific Prime, rose petal turn down service and chocolate covered strawberries and sparkling wine. Finish your stay with a lovely breakfast before ending your terrific getaway. This trip is all about relaxing and rejuvenating with your love. On the shores of stunning Okanagan Lake, this upscale resort has all you could want to surprise your special someone. They offer a package that will allow you to really put your feet up and take a breath away from the world. Includes one night stay in a luxury studio complete with highest quality bedding for a perfect sleep, breakfast basket, bottle of wine and a 2pm late check in so you can indulge in a sleep in! There is nothing like a natural escape with your loved one. Set in nature, The Black Rock Resort in Ucluelet, Vancouver Island’s rugged coast, offers contemporary comfort with natures beauty. The resort was built with inspiration from the landscape, using innovative architecture including natural light and natural additions such as rock, glass, steel and wood. The resort offers a romantic package with includes 2 nights, a handmade chocolate plate, sparkling wine and turn down service. With a spa on site, it’s easy to add some relaxing treatment to enhance your weekend away. Enjoy some history and head to North America’s first backcountry ski lodge built in 1928! Now, enjoy its charm and welcoming atmosphere. The lodge is located at the base of Mt. Assiniboine and 28 kilometres from the main road allowing for you and your partner to have a weekend completely focussed on one another. During the day enjoy hiking, skiIng and enjoy the crisp mountain air. At the lodge enjoy fresh food, warm drinks and fireside hang outs. It’s a family run and family style lodge allowing you to connect with new people while enjoying beautiful nature of British Columbia.